After claiming the lead March 20 in the Toyota Tundra Bassmaster Angler of the Year race, Jones took a scouting trip. Not to the next-up Bassmaster Elite Series venue, or even to the next after that. He had thought ahead to the fifth event, the May 5-8 contest on West Point Lake. Scouting is a luxury for a Bassmaster Elite Series angler. Any such trip must be completed before the off-limits period kicks in, usually about one month before the event. Time and money are required, not to mention the logistics trick of getting to Lake E between events on Lake A and River B, with multiple other commitments thrown into the mix. But West Point was looking like a wild card for Jones in his bid to be the 2011 Angler of the Year. He felt he had to go, not to learn how to compete on the Georgia-Alabama border lake, but to find out how he could best spend the three practice days preceding the tournament. “How I’m going to attack the lake during practice, which rods are going to be out on my deck, what baits are going to be in my compartments — those are the types of things I figured out during scouting,” said the Elite Series pro from Waco, Texas. He said he spent most of his scouting time riding. The water level was down about 3 feet — still winter pool — a condition that allowed Jones to see subtle contours and details of points that likely will be hidden under feet of water come tournament time. 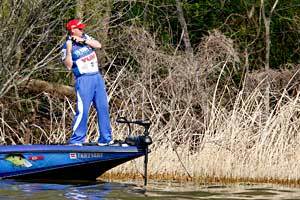 Busman’s holiday: Bassmaster Elite Series pro Steve Kennedy went fishing on his week off. Give him credit: He left his bass rig at home. This was a family-and-friends saltwater trip to Florida, a world away from competitive bass fishing. The Kennedys packed their RV, hitched their 25-foot Boston Whaler to it, and drove from their Auburn, Ala., home to Cape San Blas for a week of fun, sun and fishing on the Gulf of Mexico. If they’d stayed at home, the Kennedys would have been less than an hour away from the next Bassmaster Elite Series competition, May 5-8 on West Point Lake out of LaGrange, Ga. But now they will have a drive of about five hours — swinging through Auburn, of course, to swap boats. * $500 from Berkley to Jared Lintner for his 8-pound, 10-ounce catch, the Berkley Big Bass of the Tournament.